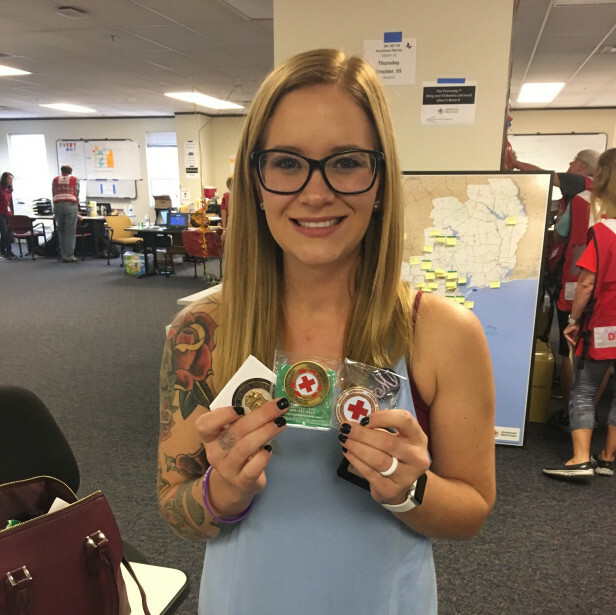 Megan Bell holds up the challenge coins she earned through distinctive service from the Houston Police Department and the Red Cross. The American Red Cross works closely with government and community agencies to help our neighbors impacted by Hurricane Harvey. For a short time, several hundred Houstonians lived in shelters, one of which was located at the Fannin Street Houston Community College. Red Cross nurse Megan Bell was assigned to the night shift at this shelter and her hard work and dedication to those she serves was observed by Houston Police Lieutenant Clifton Holloway. Below, in Clifton’s own words, he explains why Megan exemplifies the Red Cross mission. My name is Clifton Holloway and I am a Lieutenant with the Houston Police Department. I have been assigned as the evening and nights shift Commander at the Red Cross shelter on Fannin Street in Houston. I’m writing you this letter in regard to the outstanding performance of Megan Bell, a nurse assigned to the shelter at night. When Megan Bell arrived at the shelter on September 24, the Red Cross stopped providing medical attention and began providing medical care. Many of the clients at the shelter have serious medical and mental ailments and all of them have been through a nightmare to bring them to us here at the shelter. Understandably, many people were frustrated by their situation. When Megan arrived, she displayed a natural talent at calming residents, and showed a level of caring and giving that I am not accustomed to seeing. She is one of those rare people who are truly gifted at her chosen profession. I’d like to give you a few examples of what I mean. We had an elderly lady with a walker that made the most horrendous noise when she walked with it. Every night, she would get up after lights out to use the restroom and everyone would know she was coming. When Megan first experienced this, she noticed the problem and the next shift showed up with a new walker. The look on the lady’s face was all the reward Megan needed. On October 3, Megan found out that a little girl was turning 5 years old on October 4. The next shift, Megan showed up early with a cake, balloons and a gift for the young girl, purchased out of her own pocket. The little girl’s face lit up the entire room for the rest of the shift and her mom was visibly moved by Megan’s act of kindness. As I’m writing this, the rest of the nurses just came over and started singing happy birthday to the little girl. You guys are awesome. I could go on and on with stories like these, but I know you’re busy. On top of her acts of giving, Megan has been active in our little community here at the shelter. Her knowledge of her patients’ conditions and on-the-spot recall was invaluable to us in responding appropriately to countless situations. She also established a rapport with several of our “repeat customers” and was able to diffuse a situation on more than one occasion. To say she has been invaluable to our law enforcement mission is a disservice to her. Being a nurse, I should also mention how impressive a nurse Megan has been. She has been putting on a show out here. I will admit to being completely ignorant on the names of the procedures she has conducted, but from what I can see she has been putting her skills as an emergency room nurse to very good work. I have no doubt she will have a long and successful career in her field. More important than all of the above is the work ethic and attitude Megan brings into the shelter every day. She constantly has a smile on her face. She knows the majority of the people in the shelter and is constantly waving and greeting people. Her energy level is unmatched. I’ve seen her doing everything from changing bandages to moving cots to taking out the trash, and I have yet to hear her complain. She has made my job easier by taking it upon herself to bring my officers water, talk to them for a few minutes, see how they are doing and generally lift their spirits. She truly lights up the shelter every day when she arrives. Megan Bell reacts to Houston Police Lieutenant Clifton Holloway’s letter of appreciation. For her dedicated volunteer work and service to the citizens of Houston, I will be submitting Megan’s name for several awards given out by the City every year. I do not know how your organization tracks the excellence of your volunteers, but I just wanted you to know that you have an exceptional person working for you and she is constantly increasing the reputation of the American Red Cross. Are you a healthcare professional who wants to give back to your community? 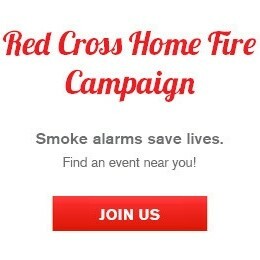 Follow the link redcross.org/volunteer to share your talents and passion with the Red Cross!